I was so thankful for the donations to Bucket Buddies that I received this past week!! The Koinonia Sunday School class at Osgood Baptist Church has been such a faithful supporter to Bucket Buddies Mission. They presented me with a check of $320.37 bringing the total of their donations to $2,054.50!! That is so amazing. This group passes around a little bucket in their class each week to take up a collection and then sends a check every couple of months. I am so appreciative of this donation and this partnership we have! Also Tom Tepe Auto donated the proceeds from its golf tournament to Bucket Buddies as well. They presented us with a check for $2,000!!! This is so awesome!! Harry Tepe and his team have been wonderful! This group could choose any non-profit in which to donate and I am so humbled and thankful that for the last two years they have chosen Bucket Buddies Mission. We could not do all that we are able to do without the support of people like the wonderful group from Koinonia Sunday School Class and the gracious people at Tom Tepe Auto. Because of your donation Bucket Buddies Mission will be able to make a difference to over 300 more children who suffer from cancer and other life-threatening illnesses. Thank you from the bottom of my heart!! To read more about Bucket Buddies Mission, click here. 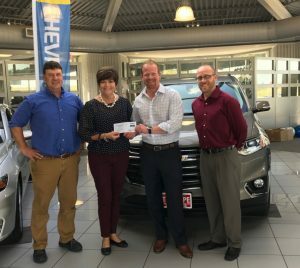 Thank you to the team at Tom Tepe Auto for donating funds raised at its Annual Golf Tournament! This entry was posted in Uncategorized on September 24, 2017 by Deanna Young.